Munich (/ˈmjuːnɪk/; German: München [ˈmʏnçn̩] (listen); Austro-Bavarian: Minga [ˈmɪŋ(ː)ɐ]; Polish: Monachium) is the capital and most populous city of Bavaria, the second most populous German federal state. With a population of around 1.5 million, it is the third-largest city in Germany, after Berlin and Hamburg, as well as the 12th-largest city in the European Union. The city's metropolitan region is home to 6 million people. 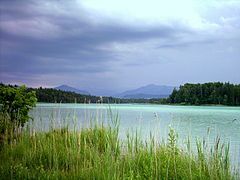 Straddling the banks of the River Isar (a tributary of the Danube) north of the Bavarian Alps, it is the seat of the Bavarian administrative region of Upper Bavaria, while being the most densely populated municipality in Germany (4,500 people per km²). Munich is the second-largest city in the Bavarian dialect area, after the Austrian capital of Vienna. The city is a global centre of art, science, technology, finance, publishing, culture, innovation, education, business, and tourism and enjoys a very high standard and quality of living, reaching first in Germany and third worldwide according to the 2018 Mercer survey, and being rated the world's most liveable city by the Monocle's Quality of Life Survey 2018. According to the Globalization and World Rankings Research Institute Munich is considered an alpha-world city, as of 2015. Munich is a major international center of engineering, science, innovation, and research, exemplified by the presence of two research universities, a multitude of scientific institutions in the city and its surroundings, and world class technology and science museums like the Deutsches Museum and BMW Museum.. Munich houses many multinational companies and its economy is based on high tech, automobiles, the service sector and creative industries, as well as IT, biotechnology, engineering and electronics among many others. The name of the city is derived from the Old/Middle High German term Munichen, meaning "by the monks". It derives from the monks of the Benedictine order, who ran a monastery at the place that was later to become the Old Town of Munich; hence the monk depicted on the city's coat of arms. Munich was first mentioned in 1158. Catholic Munich strongly resisted the Reformation and was a political point of divergence during the resulting Thirty Years' War, but remained physically untouched despite an occupation by the Protestant Swedes. Once Bavaria was established as a sovereign kingdom in 1806, it became a major European centre of arts, architecture, culture and science. In 1918, during the German Revolution, the ruling house of Wittelsbach, which had governed Bavaria since 1180, was forced to abdicate in Munich and a short-lived socialist republic was declared. In the 1920s, Munich became home to several political factions, among them the NSDAP. The first attempt of the Nazi movement to take over the German government in 1923 with the Beer Hall Putsch was stopped by the Bavarian police in Munich with gunfire. After the Nazis' rise to power, Munich was declared their "Capital of the Movement". During World War II, Munich was heavily bombed and more than 50% of the entire city and up to 90% of the historic centre were destroyed. After the end of postwar American occupation in 1949, there was a great increase in population and economic power during the years of Wirtschaftswunder, or "economic miracle". Unlike many other German cities which were heavily bombed, Munich restored most of its traditional cityscape and hosted the 1972 Summer Olympics. The 1980s brought strong economic growth, high-tech industries and scientific institutions, and population growth. The city is home to major corporations like BMW, Siemens, MAN, Linde, Allianz and MunichRE. Munich is home to many universities, museums and theatres. Its numerous architectural attractions, sports events, exhibitions and its annual Oktoberfest attract considerable tourism. Munich is one of the most prosperous and fastest growing cities in Germany. It is a top-ranked destination for migration and expatriate location. Munich hosts more than 530,000 people of foreign background, making up 37.7% of its population. The first known settlement in the area was of Benedictine monks on the Salt road. The foundation date is not considered the year 1158, the date the city was first mentioned in a document. The document was signed in Augsburg. By then, the Guelph Henry the Lion, Duke of Saxony and Bavaria, had built a toll bridge over the river Isar next to the monk settlement and on the salt route. But as part of the archaeological excavations at Marienhof in advance of the expansion of the S-Bahn from 2012 shards of vessels from the eleventh century were found, which prove again that the settlement Munich must be older than their first documentary mention from 1158. In 1175 Munich received city status and fortification. In 1180 with the trial of Henry the Lion, Otto I Wittelsbach became Duke of Bavaria, and Munich was handed to the Bishop of Freising. (Wittelsbach's heirs, the Wittelsbach dynasty, ruled Bavaria until 1918.) In 1240, Munich was transferred to Otto II Wittelsbach and in 1255, when the Duchy of Bavaria was split in two, Munich became the ducal residence of Upper Bavaria. Duke Louis IV, a native of Munich, was elected German king in 1314 and crowned as Holy Roman Emperor in 1328. He strengthened the city's position by granting it the salt monopoly, thus assuring it of additional income. In the late 15th century, Munich underwent a revival of gothic arts: the Old Town Hall was enlarged, and Munich's largest gothic church – the Frauenkirche – now a cathedral, was constructed in only 20 years, starting in 1468. When Bavaria was reunited in 1506, Munich became its capital. The arts and politics became increasingly influenced by the court (see Orlando di Lasso and Heinrich Schütz). During the 16th century, Munich was a centre of the German counter reformation, and also of renaissance arts. Duke Wilhelm V commissioned the Jesuit Michaelskirche, which became a centre for the counter-reformation, and also built the Hofbräuhaus for brewing brown beer in 1589. The Catholic League was founded in Munich in 1609. In 1623, during the Thirty Years' War, Munich became electoral residence when Maximilian I, Duke of Bavaria was invested with the electoral dignity, but in 1632 the city was occupied by Gustav II Adolph of Sweden. When the bubonic plague broke out in 1634 and 1635, about one third of the population died. Under the regency of the Bavarian electors, Munich was an important centre of baroque life, but also had to suffer under Habsburg occupations in 1704 and 1742. In 1806 the city became the capital of the new Kingdom of Bavaria, with the state's parliament (the Landtag) and the new archdiocese of Munich and Freising being located in the city. Twenty years later, Landshut University was moved to Munich. Many of the city's finest buildings belong to this period and were built under the first three Bavarian kings. Especially Ludwig I rendered outstanding services to Munich's status as a centre of the arts, attracting numerous artists and enhancing the city's architectural substance with grand boulevards and buildings. On the other hand, Ludwig II, known the world over as the fairytale king, was mostly aloof from his capital and focused more on his fanciful castles in the Bavarian countryside. Nevertheless, his patronage of Richard Wagner secured his posthumous reputation, as do his castles, which still generate significant tourist income for Bavaria. Later, Prince Regent Luitpold's years as regent were marked by tremendous artistic and cultural activity in Munich, enhancing its status as a cultural force of global importance (see Franz von Stuck and Der Blaue Reiter). Following the outbreak of World War I in 1914, life in Munich became very difficult, as the Allied blockade of Germany led to food and fuel shortages. During French air raids in 1916, three bombs fell on Munich. After World War I, the city was at the centre of substantial political unrest. In November 1918 on the eve of German revolution, Ludwig III and his family fled the city. After the murder of the first republican premier of Bavaria Kurt Eisner in February 1919 by Anton Graf von Arco auf Valley, the Bavarian Soviet Republic was proclaimed. When Communists took power, Lenin, who had lived in Munich some years before, sent a congratulatory telegram, but the Soviet Republic was ended on 3 May 1919 by the Freikorps. While the republican government had been restored, Munich became a hotbed of extremist politics, among which Adolf Hitler and the National Socialists soon rose to prominence. In 1923, Adolf Hitler and his supporters, who were concentrated in Munich, staged the Beer Hall Putsch, an attempt to overthrow the Weimar Republic and seize power. The revolt failed, resulting in Hitler's arrest and the temporary crippling of the Nazi Party (NSDAP). The city again became important to the Nazis when they took power in Germany in 1933. The party created its first concentration camp at Dachau, 16 kilometres (9.9 miles) north-west of the city. Because of its importance to the rise of National Socialism, Munich was referred to as the Hauptstadt der Bewegung ("Capital of the Movement"). The NSDAP headquarters were in Munich and many Führerbauten ("Führer-buildings") were built around the Königsplatz, some of which still survive. The city is known as the site of the culmination of the policy of appeasement by Britain and France leading up to World War II. It was in Munich that British Prime Minister Neville Chamberlain assented to the annexation of Czechoslovakia's Sudetenland region into Greater Germany in the hopes of sating the desires of Hitler's Third Reich. The city was heavily damaged by allied bombing during World War II by 71 air raids over five years. After US occupation in 1945, Munich was completely rebuilt following a meticulous plan, which preserved its pre-war street grid. In 1957, Munich's population surpassed 1 million. The city continued to play a highly significant role in the German economy, politics and culture, giving rise to its nickname Heimliche Hauptstadt ("secret capital") in the decades after World War II. Munich was the site of the 1972 Summer Olympics, during which Israeli athletes were assassinated by Palestinian fedayeen in the Munich massacre, when gunmen from the Palestinian "Black September" group took hostage members of the Israeli Olympic team. Most Munich residents enjoy a high quality of life. Mercer HR Consulting consistently rates the city among the top 10 cities with the highest quality of life worldwide – a 2011 survey ranked Munich as 4th. The same company also ranks Munich as the 39th most expensive in the world and most expensive major city in Germany. Munich enjoys a thriving economy, driven by the information technology, biotechnology, and publishing sectors. Environmental pollution is low, although as of 2006 the city council is concerned about levels of particulate matter (PM), especially along the city's major thoroughfares. Since the enactment of EU legislation concerning the concentration of particulate in the air, environmental groups such as Greenpeace have staged large protest rallies to urge the city council and the State government to take a harder stance on pollution. Today, the crime rate is low compared with other large German cities, such as Hamburg or Berlin. For its high quality of life and safety, the city has been nicknamed "Toytown" among the English-speaking residents. German inhabitants call it "Millionendorf", an expression which means "village of a million people". Due to the high standard of living in and the thriving economy of the city and the region, there was an influx of people and Munich's population surpassed 1.5 million by June 2015, an increase of more than 20% in 10 years. Munich lies on the elevated plains of Upper Bavaria, about 50 km (31 mi) north of the northern edge of the Alps, at an altitude of about 520 m (1,706 ft) ASL. The local rivers are the Isar and the Würm. Munich is situated in the Northern Alpine Foreland. The northern part of this sandy plateau includes a highly fertile flint area which is no longer affected by the folding processes found in the Alps, while the southern part is covered with morainic hills. Between these are fields of fluvio-glacial out-wash, such as around Munich. Wherever these deposits get thinner, the ground water can permeate the gravel surface and flood the area, leading to marshes as in the north of Munich. By Köppen classification templates and updated data the climate is oceanic (Cfb), independent of the isotherm but with some humid continental (Dfb) features like warm to hot summers and cold winters, but without permanent snow cover. The proximity to the Alps brings higher volumes of rainfall and consequently greater susceptibility to flood problems. Studies of adaptation to climate change and extreme events are carried out, one of them is the Isar Plan of the EU Adaptation Climate. The city center lies between both climates, while the airport of Munich has a humid continental climate. The warmest month, on average, is July. The coolest is January. Showers and thunderstorms bring the highest average monthly precipitation in late spring and throughout the summer. The most precipitation occurs in June, on average. Winter tends to have less precipitation, the least in February. 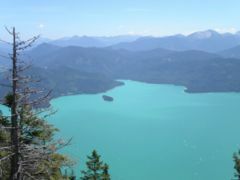 The higher elevation and proximity to the Alps cause the city to have more rain and snow than many other parts of Germany. The Alps affect the city's climate in other ways too; for example, the warm downhill wind from the Alps (föhn wind), which can raise temperatures sharply within a few hours even in the winter. At Munich's official weather station, the highest and lowest temperatures ever measured are 37.5 °C (100 °F), on 27 July 1983 in Trudering-Riem, and −31.6 °C (−24.9 °F), on 12 February 1929 in Botanic Garden of the city. From only 24,000 inhabitants in 1700, the city population doubled about every 30 years. It was 100,000 in 1852, 250,000 in 1883 and 500,000 in 1901. Since then, Munich has become Germany's third largest city. In 1933, 840,901 inhabitants were counted, and in 1957 over 1 million. In July 2017, Munich had 1.42 million inhabitants; 421,832 foreign nationals resided in the city as of 31.12.2017 with 50.7% of these residents being citizens of EU member states, and 25.2% citizens in European states not in the EU (including Russia and Turkey). The largest groups of foreign nationals were Turks (39,204), Croats (33,177), Italians (27,340), Greeks (27,117), Poles (27,945), Austrians (21,944), and Romanians (18,085). About 45% of Munich's residents are not affiliated with any religious group, this ratio represents the fastest growing segment of the population. As in the rest of Germany, the Roman Catholic and Protestant churches have experienced a continuous decline in membership. As of 31 December 2017, 31.8% of the city's inhabitants were Roman Catholic, 11.4% Protestant, 0.3% Jewish, and 3.6% were members of an Orthodox Church (Eastern Orthodox or Oriental Orthodox). About 1% adhere to other Christian denominations. There is also a small Old Catholic parish and an English-speaking parish of the Episcopal Church in the city. Munich's current mayor is Dieter Reiter of the Social Democratic Party of Germany. Munich has been governed by the SPD for all but six years since 1948. This is atypical because Bavaria – and particularly southern Bavaria – has long been identified with conservative politics, with the Christian Social Union gaining absolute majorities among the Bavarian electorate in many elections at the communal, state, and federal levels, and leading the Bavarian state government for all but three years since 1946. Bavaria's second most populous city, Nuremberg, is also one of the very few Bavarian cities governed by an SPD-led coalition. Since the administrative reform in 1992, Munich is divided into 25 boroughs or Stadtbezirke, which themselves consist of sometimes quite distinct smaller quarters. Allach-Untermenzing (23), Altstadt-Lehel (1), Aubing-Lochhausen-Langwied (22), Au-Haidhausen (5), Berg am Laim (14), Bogenhausen (13), Feldmoching-Hasenbergl (24), Hadern (20), Laim (25), Ludwigsvorstadt-Isarvorstadt (2), Maxvorstadt (3), Milbertshofen-Am Hart (11), Moosach (10), Neuhausen-Nymphenburg (9), Obergiesing (17), Pasing-Obermenzing (21), Ramersdorf-Perlach (16), Schwabing-Freimann (12), Schwabing-West (4), Schwanthalerhöhe (8), Sendling (6), Sendling-Westpark (7), Thalkirchen-Obersendling-Forstenried-Fürstenried-Solln (19), Trudering-Riem (15) and Untergiesing-Harlaching (18). The city has an eclectic mix of historic and modern architecture, because historic buildings destroyed in World War II were reconstructed, and new landmarks were built. A survey by the Society's Centre for Sustainable Destinations for the National Geographic Traveller chose over 100 historic destinations around the world and ranked Munich 30th. At the centre of the city is the Marienplatz – a large open square named after the Mariensäule, a Marian column in its centre – with the Old and the New Town Hall. Its tower contains the Rathaus-Glockenspiel. Three gates of the demolished medieval fortification survive – the Isartor in the east, the Sendlinger Tor in the south and the Karlstor in the west of the inner city. The Karlstor leads up to the Stachus, a grand square dominated by the Justizpalast (Palace of Justice) and a fountain. The Frauenkirche is the best known building in the city centre and serves as the cathedral for the Catholic Archdiocese of Munich and Freising. The nearby Michaelskirche is the largest renaissance church north of the Alps, while the Theatinerkirche is a basilica in Italianate high baroque, which had a major influence on Southern German baroque architecture. Its dome dominates the Odeonsplatz. Other baroque churches in the inner city include the Bürgersaalkirche, the Dreifaltigkeitskirche and the St. Anna Damenstiftskirche. The Asamkirche was endowed and built by the Brothers Asam, pioneering artists of the rococo period. The large Residenz palace complex (begun in 1385) on the edge of Munich's Old Town, Germany's largest urban palace, ranks among Europe's most significant museums of interior decoration. Having undergone several extensions, it contains also the treasury and the splendid rococo Cuvilliés Theatre. Next door to the Residenz the neo-classical opera, the National Theatre was erected. Among the baroque and neoclassical mansions which still exist in Munich are the Palais Porcia, the Palais Preysing, the Palais Holnstein and the Prinz-Carl-Palais. All mansions are situated close to the Residenz, same as the Alte Hof, a medieval castle and first residence of the Wittelsbach dukes in Munich. Lehel, a middle-class quarter east of the Altstadt, is characterised by countless well-preserved (and in parts excellently reconstructed) townhouses, giving a thorough impression of the "old Munich" outside of the main tourist routes. 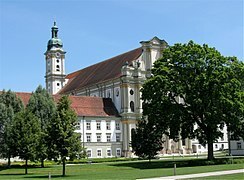 The St. Anna im Lehel is the first rococo church in Bavaria. St. Lukas is the largest Protestant Church in Munich. The neoclassical Brienner Straße, starting at Odeonsplatz on the northern fringe of the Old Town close to the Residenz, runs from east to west and opens into the impressive Königsplatz, designed with the "Doric" Propyläen, the "Ionic" Glyptothek and the "Corinthian" State Museum of Classical Art, behind it St. Boniface's Abbey was erected. The area around Königsplatz is home to the Kunstareal, Munich's gallery and museum quarter (as described below). Ludwigstraße also begins at Odeonsplatz and runs from south to north, skirting the Ludwig-Maximilians-Universität, the St. Louis church, the Bavarian State Library and numerous state ministries and palaces. The southern part of the avenue was constructed in Italian renaissance style, while the north is strongly influenced by Italian Romanesque architecture. The Siegestor (gate of victory) sits at the northern end of Ludwigstraße, where the latter passes over into Leopoldstraße and the district of Schwabing begins. The neo-Gothic Maximilianstraße starts at Max-Joseph-Platz, where the Residenz and the National Theatre are situated, and runs from west to east. The avenue is framed by elaborately structured neo-Gothic buildings which house, among others, the Schauspielhaus, the Building of the district government of Upper Bavaria and the Museum of Ethnology. After crossing the river Isar, the avenue circles the Maximilianeum, which houses the state parliament. The western portion of Maximilianstraße is known for its designer shops, luxury boutiques, jewellery stores, and one of Munich's foremost five-star hotels, the Hotel Vier Jahreszeiten. Prinzregentenstraße runs parallel to Maximilianstraße and begins at Prinz-Carl-Palais. Many museums are on the avenue, such as the Haus der Kunst, the Bavarian National Museum and the Schackgalerie. The avenue crosses the Isar and circles the Friedensengel monument, then passing the Villa Stuck and Hitler's old apartment. The Prinzregententheater is at Prinzregentenplatz further to the east. In Schwabing and Maxvorstadt, many beautiful streets with continuous rows of Gründerzeit buildings can be found. Rows of elegant town houses and spectacular urban palais in many colours, often elaborately decorated with ornamental details on their façades, make up large parts of the areas west of Leopoldstraße (Schwabing's main shopping street), while in the eastern areas between Leopoldstraße and Englischer Garten similar buildings alternate with almost rural-looking houses and whimsical mini-castles, often decorated with small towers. Numerous tiny alleys and shady lanes connect the larger streets and little plazas of the area, conveying the legendary artist's quarter's flair and atmosphere convincingly like it was at the turn of the 20th century. The wealthy district of Bogenhausen in the east of Munich is another little-known area (at least among tourists) rich in extravagant architecture, especially around Prinzregentenstraße. One of Bogenhausen's most beautiful buildings is Villa Stuck, famed residence of painter Franz von Stuck. Two large baroque palaces in Nymphenburg and Oberschleissheim are reminders of Bavaria's royal past. Schloss Nymphenburg (Nymphenburg Palace), some 6 km (4 mi) north west of the city centre, is surrounded by an impressive park and is considered to be one of Europe's most beautiful royal residences. 2 km (1 mi) northwest of Nymphenburg Palace is Schloss Blutenburg (Blutenburg Castle), an old ducal country seat with a late-Gothic palace church. Schloss Fürstenried (Fürstenried Palace), a baroque palace of similar structure to Nymphenburg but of much smaller size, was erected around the same time in the south west of Munich. The second large baroque residence is Schloss Schleissheim (Schleissheim Palace), located in the suburb of Oberschleissheim, a palace complex encompassing three separate residences: Altes Schloss Schleissheim (the old palace), Neues Schloss Schleissheim (the new palace) and Schloss Lustheim (Lustheim Palace). Most parts of the palace complex serve as museums and art galleries. Deutsches Museum's Flugwerft Schleissheim flight exhibition centre is located nearby, on the Schleissheim Special Landing Field. The Bavaria statue before the neo-classical Ruhmeshalle is a monumental, bronze sand-cast 19th-century statue at Theresienwiese. The Grünwald castle is the only medieval castle in the Munich area which still exists. St Michael in Berg am Laim might be the most remarkable church in the suburbs. Another church of Johann Michael Fischer is St George in Bogenhausen. 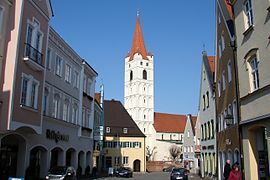 Most of the boroughs have parish churches which originate from the Middle Ages like the most famous church of pilgrimage in Munich St Mary in Ramersdorf. The oldest church within the city borders is Heilig Kreuz in Fröttmaning next to the Allianz-Arena, known for its Romanesque fresco. Especially in its suburbs, Munich features a wide and diverse array of modern architecture, although strict culturally sensitive height limitations for buildings have limited the construction of skyscrapers to avoid a loss of views to the distant Bavarian Alps. Most high-rise buildings are clustered at the northern edge of Munich in the skyline, like the Hypo-Haus, the Arabella High-Rise Building, the Highlight Towers, Uptown Munich, Münchner Tor and the BMW Headquarters next to the Olympic Park. Several other high-rise buildings are located near the city centre and on the Siemens campus in southern Munich. A landmark of modern Munich is also the architecture of the sport stadiums (as described below). In Fasangarten is the former McGraw Kaserne, a former US army base, near Stadelheim Prison. Munich is a densely-built city but still offers numerous public parks. The Englischer Garten, close to the city centre and covering an area of 3.7 km2 (1.4 sq mi) is larger than Central Park in New York City, is one of the world's largest urban public parks. It contains a naturist (nudist) area, numerous bicycle and jogging tracks as well as bridle-paths. It is considered the "green lung" of Munich and one of the city's best-loved features. It was designed and laid out by Benjamin Thompson, Count of Rumford, for both pleasure and as a work area for the city's vagrants and homeless. Nowadays it is entirely a park, its southern half being dominated by wide and extremely well-kept open areas, hills, monuments and beach-like stretches (along the streams Eisbach and Schwabinger Bach), which get crowded in summer. In contrast, its less-frequented northern part is much more quiet, idyllic and natural-seeming, at times resembling a natural preserve more than an urban public park: it has lots of old trees, thick undergrowth, winding streams, hidden meadows and is pervaded by numerous romantic pathways. Multiple Biergartens can be found in both parts of the Englischer Garten, the most well known being located at the Chinese Pagoda. Other large green spaces are the modern Olympiapark, Westpark, and the parks of Nymphenburg Palace (with the Botanischer Garten München-Nymphenburg to the north), and Schleissheim Palace. The city's oldest park is the Hofgarten, near the Residenz, dating back to the 16th century. Best known for the largest beergarden in town is the former royal Hirschgarten, founded in 1780 for deer, which still live there. The city's zoo is the Tierpark Hellabrunn near the Flaucher Island in the Isar in the south of the city. Another notable park is Ostpark located in the Ramersdorf-Perlach borough which also houses the Michaelibad, the largest waterpark in Munich. Munich is home to several professional football teams including Bayern Munich, Germany's most successful club and a multiple UEFA Champions League winner. Other notable clubs include 1860 Munich, who were long time their rivals on a somewhat equal footing, but currently play in the 3rd Division 3. Liga along with another former Bundesliga club SpVgg Unterhaching. FC Bayern Munich Basketball is currently playing in the Beko Basket Bundesliga. The city hosted the final stages of the FIBA EuroBasket 1993, where the German national basketball team won the gold medal. Munich hosted the 1972 Summer Olympics; the Munich Massacre took place in the Olympic village. It was one of the host cities for the 2006 Football World Cup, which was not held in Munich's Olympic Stadium, but in a new football specific stadium, the Allianz Arena. Munich bid to host the 2018 Winter Olympic Games, but lost to Pyeongchang. In September 2011 the DOSB President Thomas Bach confirmed that Munich would bid again for the Winter Olympics in the future. Regular annual road running events in Munich are the Munich Marathon in October, the Stadtlauf end of June, the company run B2Run in July, the New Year's Run on 31 December, the Spartan Race Sprint, the Olympia Alm Crosslauf and the Bestzeitenmarathon. Public sporting facilities in Munich include ten indoor swimming pools and eight outdoor swimming pools, which are operated by the Munich City Utilities (SWM) communal company. Popular indoor swimming pools include the Olympia Schwimmhalle of the 1972 Summer Olympics, the wave pool Cosimawellenbad, as well as the Müllersches Volksbad which was built in 1901. 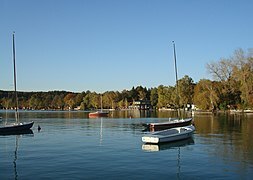 Further, swimming within Munich's city limits is also possible in several artificial lakes such as for example the Riemer See or the Langwieder lake district. Munich has a reputation as a surfing hotspot, offering the world's best known river surfing spot, the Eisbach wave, which is located at the southern edge of the Englischer Garten park and used by surfers day and night and throughout the year. Half a kilometre down the river, there is a second, easier wave for beginners, the so-called Kleine Eisbachwelle. Two further surf spots within the city are located along the river Isar, the wave in the Floßlände channel and a wave downstream of the Wittelsbacherbrücke bridge. The Bavarian dialects are spoken in and around Munich, with its variety West Middle Bavarian or Old Bavarian (Westmittelbairisch / Altbairisch). 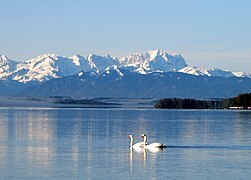 Austro-Bavarian has no official status by the Bavarian authorities or local government, yet is recognised by the SIL and has its own ISO-639 code. The Deutsches Museum or German Museum, located on an island in the River Isar, is the largest and one of the oldest science museums in the world. Three redundant exhibition buildings that are under a protection order were converted to house the Verkehrsmuseum, which houses the land transport collections of the Deutsches Museum. Deutsches Museum's Flugwerft Schleissheim flight exhibition centre is located nearby, on the Schleissheim Special Landing Field. Several non-centralised museums (many of those are public collections at Ludwig-Maximilians-Universität) show the expanded state collections of palaeontology, geology, mineralogy, zoology, botany and anthropology. The city has several important art galleries, most of which can be found in the Kunstareal, including the Alte Pinakothek, the Neue Pinakothek, the Pinakothek der Moderne and the Museum Brandhorst. The Alte Pinakothek contains a treasure trove of the works of European masters between the 14th and 18th centuries. The collection reflects the eclectic tastes of the Wittelsbachs over four centuries, and is sorted by schools over two floors. Major displays include Albrecht Dürer's Christ-like Self-Portrait (1500), his Four Apostles, Raphael's paintings The Canigiani Holy Family and Madonna Tempi as well as Peter Paul Rubens large Judgment Day. The gallery houses one of the world's most comprehensive Rubens collections. The Lenbachhaus houses works by the group of Munich-based modernist artists known as Der Blaue Reiter (The Blue Rider). An important collection of Greek and Roman art is held in the Glyptothek and the Staatliche Antikensammlung (State Antiquities Collection). King Ludwig I managed to acquire such famous pieces as the Medusa Rondanini, the Barberini Faun and figures from the Temple of Aphaea on Aegina for the Glyptothek. Another important museum in the Kunstareal is the Egyptian Museum. The gothic Morris dancers of Erasmus Grasser are exhibited in the Munich City Museum in the old gothic arsenal building in the inner city. Another area for the arts next to the Kunstareal is the Lehel quarter between the old town and the river Isar: the Museum Five Continents in Maximilianstraße is the second largest collection in Germany of artefacts and objects from outside Europe, while the Bavarian National Museum and the adjoining Bavarian State Archaeological Collection in Prinzregentenstraße rank among Europe's major art and cultural history museums. The nearby Schackgalerie is an important gallery of German 19th-century paintings. The former Dachau concentration camp is 16 km (10 mi) outside the city. Munich is a major European cultural centre and has played host to many prominent composers including Orlando di Lasso, W.A. Mozart, Carl Maria von Weber, Richard Wagner, Gustav Mahler, Richard Strauss, Max Reger and Carl Orff. With the Munich Biennale founded by Hans Werner Henze, and the A*DEvantgarde festival, the city still contributes to modern music theatre. Some of classical music's best-known pieces have been created in and around Munich by composers born in the area, for example Richard Strauss's tone poem Also sprach Zarathustra or Carl Orff's Carmina Burana. At the Nationaltheater several of Richard Wagner's operas were premiered under the patronage of Ludwig II of Bavaria. It is the home of the Bavarian State Opera and the Bavarian State Orchestra. Next door, the modern Residenz Theatre was erected in the building that had housed the Cuvilliés Theatre before World War II. Many operas were staged there, including the premiere of Mozart's Idomeneo in 1781. The Gärtnerplatz Theatre is a ballet and musical state theatre while another opera house, the Prinzregententheater, has become the home of the Bavarian Theatre Academy. The modern Gasteig centre houses the Munich Philharmonic Orchestra. The third orchestra in Munich with international importance is the Bavarian Radio Symphony Orchestra. Its primary concert venue is the Herkulessaal in the former city royal residence, the Munich Residenz. Many important conductors have been attracted by the city's orchestras, including Felix Weingartner, Hans Pfitzner, Hans Rosbaud, Hans Knappertsbusch, Sergiu Celibidache, James Levine, Christian Thielemann, Lorin Maazel, Rafael Kubelík, Eugen Jochum, Sir Colin Davis, Mariss Jansons, Bruno Walter, Georg Solti, Zubin Mehta and Kent Nagano. A stage for shows, big events and musicals is the Deutsche Theater. It is Germany's largest theatre for guest performances. Munich's contributions to modern popular music are often overlooked in favour of its strong association with classical music, but they are numerous: the city has had a strong music scene in the 1960s and 1970s, with many internationally renowned bands and musicians frequently performing in its clubs. Furthermore, Munich was the centre of Krautrock in southern Germany, with many important bands such as Amon Düül II, Embryo or Popol Vuh hailing from the city. In the 1970s, the Musicland Studios developed into one of the most prominent recording studios in the world, with bands such as the Rolling Stones, Led Zeppelin, Deep Purple and Queen recording albums there. Munich also played a significant role in the development of electronic music, with genre pioneer Giorgio Moroder, who invented synth disco and electronic dance music, and Donna Summer, one of disco music's most important performers, both living and working in the city. In the late 1990s, Electroclash was substantially co-invented if not even invented in Munich, when DJ Hell introduced and assembled international pioneers of this musical genre through his International DeeJay Gigolo Records label here. Other examples of notable musicians and bands from Munich are Konstantin Wecker, Willy Astor, Spider Murphy Gang, Münchener Freiheit, Lou Bega, Megaherz, FSK, Colour Haze and Sportfreunde Stiller. Music is so important in the Bavarian capital that the city hall gives permissions every day to 10 musicians for performing in the streets around Marienplatz. This is how performers such as Olga Kholodnaya and Alex Jacobowitz are entertaining the locals and the tourists every day. The city is known as the second largest publishing centre in the world (around 250 publishing houses have offices in the city), and many national and international publications are published in Munich, such as Arts in Munich, LAXMag and Prinz. At the turn of the 20th century, Munich, and especially its suburb of Schwabing, was the preeminent cultural metropolis of Germany. Its importance as a centre for both literature and the fine arts was second to none in Europe, with numerous German and non-German artists moving there. For example, Wassily Kandinsky chose Munich over Paris to study at the Akademie der Bildenden Künste München, and, along with many other painters and writers living in Schwabing at that time, had a profound influence on modern art. Prominent literary figures worked in Munich especially during the final decades of the Kingdom of Bavaria, the so-called Prinzregentenzeit (literally "prince regent's time") under the reign of Luitpold, Prince Regent of Bavaria, a period often described as a cultural Golden Age for both Munich and Bavaria as a whole. Among them were luminaries such as Thomas Mann, Heinrich Mann, Paul Heyse, Rainer Maria Rilke, Ludwig Thoma, Fanny zu Reventlow, Oskar Panizza, Gustav Meyrink, Max Halbe, Erich Mühsam and Frank Wedekind. For a short while, Vladimir Lenin lived in Schwabing, where he wrote and published his most important work, What Is to Be Done? Central to Schwabing's bohemian scene (although they were actually often located in the nearby Maxvorstadt quarter) were Künstlerlokale (artist's cafés) like Café Stefanie or Kabarett Simpl, whose liberal ways differed fundamentally from Munich's more traditional localities. The Simpl, which survives to this day (although with little relevance to the city's contemporary art scene), was named after Munich's famous anti-authoritarian satirical magazine Simplicissimus, founded in 1896 by Albert Langen and Thomas Theodor Heine, which quickly became an important organ of the Schwabinger Bohème. Its strikingly modern caricatures and biting satirical attacks on Wilhelmine German society were the result of countless of collaborative efforts by many of the best visual artists and writers from Munich and elsewhere. The period immediately before World War I saw continued economic and cultural prominence for the city. Thomas Mann wrote in his novella Gladius Dei about this period: "München leuchtete" (literally "Munich shone"). Munich remained a centre of cultural life during the Weimar period, with figures such as Lion Feuchtwanger, Bertolt Brecht, Peter Paul Althaus, Stefan George, Ricarda Huch, Joachim Ringelnatz, Oskar Maria Graf, Annette Kolb, Ernst Toller, Hugo Ball and Klaus Mann adding to the already established big names. Karl Valentin was Germany's most important cabaret performer and comedian and is to this day well-remembered and beloved as a cultural icon of his hometown. Between 1910 and 1940, he wrote and performed in many absurdist sketches and short films that were highly influential, earning him the nickname of "Charlie Chaplin of Germany". Many of Valentin's works wouldn't be imaginable without his congenial female partner Liesl Karlstadt, who often played male characters to hilarious effect in their sketches. After World War II, Munich soon again became a focal point of the German literary scene and remains so to this day, with writers as diverse as Wolfgang Koeppen, Erich Kästner, Eugen Roth, Alfred Andersch, Elfriede Jelinek, Hans Magnus Enzensberger, Michael Ende, Franz Xaver Kroetz, Gerhard Polt, John Vincent Palatine and Patrick Süskind calling the city their home. From the Gothic to the Baroque era, the fine arts were represented in Munich by artists like Erasmus Grasser, Jan Polack, Johann Baptist Straub, Ignaz Günther, Hans Krumpper, Ludwig von Schwanthaler, Cosmas Damian Asam, Egid Quirin Asam, Johann Baptist Zimmermann, Johann Michael Fischer and François de Cuvilliés. Munich had already become an important place for painters like Carl Rottmann, Lovis Corinth, Wilhelm von Kaulbach, Carl Spitzweg, Franz von Lenbach, Franz von Stuck, Karl Piloty and Wilhelm Leibl when Der Blaue Reiter (The Blue Rider), a group of expressionist artists, was established in Munich in 1911. The city was home to the Blue Rider's painters Paul Klee, Wassily Kandinsky, Alexej von Jawlensky, Gabriele Münter, Franz Marc, August Macke and Alfred Kubin. Kandinsky's first abstract painting was created in Schwabing. Munich was (and in some cases, still is) home to many of the most important authors of the New German Cinema movement, including Rainer Werner Fassbinder, Werner Herzog, Edgar Reitz and Herbert Achternbusch. In 1971, the Filmverlag der Autoren was founded, cementing the city's role in the movement's history. Munich served as the location for many of Fassbinder's films, among them Ali: Fear Eats the Soul. The Hotel Deutsche Eiche near Gärtnerplatz was somewhat like a centre of operations for Fassbinder and his "clan" of actors. New German Cinema is considered by far the most important artistic movement in German cinema history since the era of German Expressionism in the 1920s. In 1919, the Bavaria Film Studios were founded, which developed into one of Europe's largest film studios. Directors like Alfred Hitchcock, Billy Wilder, Orson Welles, John Huston, Ingmar Bergman, Stanley Kubrick, Claude Chabrol, Fritz Umgelter, Rainer Werner Fassbinder, Wolfgang Petersen and Wim Wenders made films there. Among the internationally well-known films produced at the studios are The Pleasure Garden (1925) by Alfred Hitchcock, The Great Escape (1963) by John Sturges, Paths of Glory (1957) by Stanley Kubrick, Willy Wonka & the Chocolate Factory (1971) by Mel Stuart and both Das Boot (1981) and The Neverending Story (1984) by Wolfgang Petersen. Munich remains one of the centres of the German film and entertainment industry. The Auer Dult is held three times a year on the square around Mariahilf church and is one of Munich's oldest markets, well known for its hardware, trinkets and antiques. Three weeks before Christmas, the Christkindlmarkt opens at Marienplatz and other squares in the city, selling Christmas goods. The Hofbräuhaus am Platzl, arguably the most famous beer hall worldwide, is located in the city centre. It also operates the second largest tent at the Oktoberfest, one of Munich's most famous attractions. For two weeks, the Oktoberfest attracts millions of people visiting its beer tents ("Bierzelte") and fairground attractions. The Oktoberfest was first held on 12 October 1810 in honour of the marriage of crown prince Ludwig to Princess Therese of Saxe-Hildburghausen. The festivities were closed with a horse race and in the following years the horse races were continued and later developed into what is now known as the Oktoberfest. Despite its name, most of Oktoberfest occurs in September. It always finishes on the first Sunday in October unless the German national holiday on 3 October (Tag der deutschen Einheit, i. e., "Day of German Unity") is a Monday or Tuesday – then the Oktoberfest remains open for these days. The Munich cuisine contributes to the Bavarian cuisine. Münchner Weißwurst ('white sausage') was invented here in 1857. It is a Munich speciality. Traditionally eaten only before noon – a tradition dating to a time before refrigerators – these morsels are often served with sweet mustard and freshly baked pretzels. Munich is known for its breweries and the Weissbier (or Weißbier / Weizenbier, wheat beer) is a speciality from Bavaria. Helles, a pale lager with a translucent gold colour is the most popular Munich beer today, although it's not old (only introduced in 1895) and is the result of a change in beer tastes. Helles has largely replaced Munich's dark beer, Dunkles, which gets its colour from roasted malt. It was the typical beer in Munich in the 19th century, but it is now more of a speciality. Starkbier is the strongest Munich beer, with 6%–9% alcohol content. It is dark amber in colour and has a heavy malty taste. It is available and is sold particularly during the Lenten Starkbierzeit (strong beer season), which begins on or before St. Joseph's Day (19 March). The beer served at Oktoberfest is a special type of Märzen beer with a higher alcohol content than regular Helles. There are countless Wirtshäuser (traditional Bavarian ale houses/restaurants) all over the city area, many of which also have small outside areas. Biergärten (beer gardens) are the most famous and popular fixtures of Munich's gastronomic landscape. They are central to the city's culture and serve as a kind of melting pot for members of all walks of life, for locals, expatriates and tourists alike. It is allowed to bring one's own food to a beer garden, however, it is forbidden to bring one's own drinks. There are many smaller beer gardens and around twenty major ones, providing at least one thousand seats, with four of the most famous and popular in the Englischer Garten: Chinesischer Turm (Munich's second largest beer garden with 7,000 seats), Seehaus, Hirschau and Aumeister. Among locals, connoisseurs and well-informed tourists, Augustiner-Keller, near Hauptbahnhof (central station) at Arnulfstraße, is one of the most popular beer gardens in the city, since it is the only one in which Munich's most popular beer, Augustiner, is drawn from wooden barrels. Nockherberg, Hofbräukeller (not to be confused with the Hofbräuhaus) and Löwenbräukeller are other famous beer gardens. Hirschgarten is the largest beer garden in the world, with 8,000 seats. There are six main breweries in Munich: Augustiner-Bräu, Hacker-Pschorr, Hofbräu, Löwenbräu, Paulaner and Spaten-Franziskaner-Bräu (separate brands Spaten and Franziskaner, the latter of which mainly for Weissbier). Also much consumed, though not from Munich and thus without the right to have a tent at the Oktoberfest, are especially Tegernseer and Schneider Weisse, the latter of which has a major beer hall in Munich just as the Munich breweries do. Smaller breweries are becoming more prevalent in Munich, such as Giesinger Bräu. However, these breweries do not have tents at Oktoberfest. The Circus Krone based in Munich is one of the largest circuses in Europe. It was the first and still is one of only a few in Western Europe to also occupy a building of its own. Nightlife in Munich is located mostly in the city centre (Altstadt-Lehel) and the boroughs Maxvorstadt, Ludwigsvorstadt-Isarvorstadt, Au-Haidhausen and Schwabing. Between Sendlinger Tor and Maximiliansplatz lies the so-called Feierbanane (party banana), a roughly banana-shaped unofficial party zone spanning 1.3 kilometres (0.8 miles) along Sonnenstraße, characterised by a high concentration of clubs, bars and restaurants. The Feierbanane has become the mainstream focus of Munich's nightlife and tends to become crowded, especially at weekends. It has also been the subject of some debate among city officials because of alcohol-related security issues and the party zone's general impact on local residents as well as day-time businesses. Ludwigsvorstadt-Isarvorstadt's two main quarters, Gärtnerplatzviertel and Glockenbachviertel, are both considered decidedly less mainstream than most other nightlife hotspots in the city and are renowned for their many hip and laid back bars and clubs as well as for being Munich's main centres of gay culture. On warm spring or summer nights, hundreds of young people gather at Gärtnerplatz to relax, talk with friends and drink beer. Maxvorstadt has many smaller bars that are especially popular with university students, whereas Schwabing, once Munich's first and foremost party district with legendary clubs such as Big Apple, PN, Domicile, Hot Club, Piper Club, Tiffany, Germany's first large-scale disco Blow Up and the underwater nightclub Yellow Submarine, as well as many bars such as Schwabinger 7 or Schwabinger Podium, has lost much of its nightlife activity in the last decades, mainly due to gentrification and the resulting high rents. It has become the city's most coveted and expensive residential district, attracting affluent citizens with little interest in partying. Since the mid-1990s, the Kunstpark Ost and its successor Kultfabrik, a former industrial complex that was converted to a large party area near München Ostbahnhof in Berg am Laim, hosted more than 30 clubs and was especially popular among younger people and residents of the metropolitan area surrounding Munich. The Kultfabrik was closed at the end of the year 2015 to convert the area into a residential and office area. Apart from the Kultfarbik and the smaller Optimolwerke, there is a wide variety of establishments in the urban parts of nearby Haidhausen. Before the Kunstpark Ost, there had already been an accumulation of internationally known nightclubs in the remains of the abandoned former Munich-Riem Airport. Munich nightlife tends to change dramatically and quickly. Establishments open and close every year, and some survive only a few months, while others last many years. Beyond the already mentioned venues of the 1960s and 1970s, nightclubs with international recognition in recent history included Tanzlokal Größenwahn, Atomic Cafe, Ultraschall, KW – Das Heizkraftwerk, Natraj Temple and Babalu Bar. From 1995 to 2001, Munich was also home to the Union Move, one of the largest technoparades in Germany. Munich has two directly connected gay quarters, which basically can be seen as one: Gärtnerplatzviertel and Glockenbachviertel, both part of the Ludwigsvorstadt-Isarvorstadt district. Freddie Mercury had an apartment near the Gärtnerplatz and transsexual icon Romy Haag had a club in the city centre for many years. Munich has more than 100 night clubs and thousands of bars and restaurants within city limits. Some notable nightclubs are: popular techno clubs are MMA Club (Mixed Munich Arts), Blitz Club, Harry Klein, Rote Sonne, Bahnwärter Thiel, Bob Beaman, Pimpernel, Charlie and Palais. Popular mixed music clubs are Call me Drella, Cord, Wannda Circus, Tonhalle, Backstage, Muffathalle, Ampere, Pacha, P1, Zenith, Minna Thiel and the party ship Alte Utting. Some notable bars (pubs are located all over the city) are Charles Schumann's Cocktail Bar, Havana Club, Sehnsucht, Bar Centrale, Ksar, Holy Home, Eat the Rich, Negroni, Die Goldene Bar and Bei Otto (a bavarian-style pub). Munich has the strongest economy of any German city and the lowest unemployment rate (3.0% in June 2014) of any German city of more than a million people (the others being Berlin, Hamburg and Cologne). 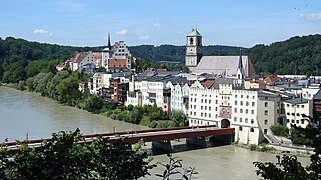 The city is also the economic centre of southern Germany. Munich topped the ranking of the magazine Capital in February 2005 for the economic prospects between 2002 and 2011 in 60 German cities. Munich is a financial center and a global city and holds the headquarters of many companies. This includes more companies listed by the DAX than any other German city, as well as the German or European headquarters of many foreign companies such as McDonald's and Microsoft. Munich holds the headquarters of Siemens AG (electronics), BMW (car), MAN AG (truck manufacturer, engineering), Linde (gases) and Rohde & Schwarz (electronics). Among German cities with more than 500,000 inhabitants, purchasing power is highest in Munich (€26,648 per inhabitant) as of 2007. In 2006, Munich blue-collar workers enjoyed an average hourly wage of €18.62 (ca. $20). The breakdown by cities proper (not metropolitan areas) of Global 500 cities listed Munich in 8th position in 2009. Munich is also a centre for biotechnology, software and other service industries. Munich is also the home of the headquarters of many other large companies such as the aircraft engine manufacturer MTU Aero Engines, the injection moulding machine manufacturer Krauss-Maffei, the camera and lighting manufacturer Arri, the semiconductor firm Infineon Technologies (headquartered in the suburban town of Neubiberg), lighting giant Osram, as well as the German or European headquarters of many foreign companies such as Microsoft. Munich has significance as a financial centre (second only to Frankfurt), being home of HypoVereinsbank and the Bayerische Landesbank. It outranks Frankfurt though as home of insurance companies such as Allianz (insurance) and Munich Re (re-insurance). Munich is the largest publishing city in Europe and home to the Süddeutsche Zeitung, one of Germany's biggest daily newspapers. The city is also the location of the programming headquarters of Germany's largest public broadcasting network, ARD, while the largest commercial network, Pro7-Sat1 Media AG, is headquartered in the suburb of Unterföhring. The headquarters of the German branch of Random House, the world's largest publishing house, and of Burda publishing group are also in Munich. Munich has an extensive public transport system consisting of an underground metro, trams, buses and high-speed rail. In 2015, the transport modal share in Munich was 38 percent public transport, 25 percent car, 23 percent walking, and 15 percent bicycle. Its public transport system delivered 566 million passenger trips that year. Munich is the hub of a well-developed regional transportation system, including the second-largest airport in Germany and the Berlin–Munich high-speed railway, which connects Munich to the German capital city with a journey time of about 4 hours. The trade fair transport logistic is held every two years at the Neue Messe München (Messe München International). For its urban population of 2.6 million people, Munich and its closest suburbs have a comprehensive network of public transport incorporating the Munich U-Bahn (underground railway), the Munich S-Bahn (suburban trains), trams and buses. The system is supervised by the Munich Transport and Tariff Association (Münchner Verkehrs- und Tarifverbund GmbH). The Munich tramway is the oldest existing public transportation system in the city, which has been in operation since 1876. Munich also has an extensive network of bus lines. The extensive network of subway and tram lines assist and complement pedestrian movement in the city centre. The 700m-long Kaufinger Straße, which starts near the Main train station, forms a pedestrian east-west spine that traverses almost the entire centre. Similarly, Weinstraße leads off northwards to the Hofgarten. These major spines and many smaller streets cover an extensive area of the centre that can be enjoyed on foot and bike. The transformation of the historic area into a pedestrian priority zone enables and invites walking and biking by making these active modes of transport comfortable, safe and enjoyable. These attributes result from applying the principle of "filtered permability", which selectively restricts the number of roads that run through the centre. While certain streets are discontinuous for cars, they connect to a network of pedestrian and bike paths, which permeate the entire centre. In addition, these paths go through public squares and open spaces increasing the enjoyment of the trip (see image). The logic of filtering a mode of transport is fully expressed in a comprehensive model for laying out neighbourhoods and districts – the Fused Grid. The average amount of time people spend commuting to and from work with public transit in Munich on a weekday is 56 min. 11% of public transit riders, ride for more than 2 hours every day. The average amount of time people wait at a stop or station for public transit is 10 min, while 6% of riders wait for over 20 minutes on average every day. The average distance people usually ride in a single trip with public transit is 9.2 km, while 21% travel for over 12 km in a single direction. Cycling has a strong presence in the city and is recognised as a good alternative to motorised transport. The growing number of bicycle lanes are widely used throughout the year. Munich cyclists have a reputation for being quite daring or even careless, being frequently seen as a nuisance by drivers, especially when their numbers multiply in the warmer months. Cycle paths can be found alongside the majority of sidewalks and streets, although the newer and/or renovated ones are much easier to tell apart from pavements than older ones. The cycle paths usually involve a longer route than by the road, as they are diverted around objects, and the presence of pedestrians can make them quite slow. A modern bike hire system is available within the area bounded by the Mittlerer Ring. München Hauptbahnhof is the main railway station located in the city centre and is one of three long distance stations in Munich, the others being München Ost (to the east) and München-Pasing (to the west). All stations are connected to the public transport system and serve as transportation hubs. München Hauptbahnhof serves about 450,000 passengers a day, which puts it on par with other large stations in Germany, such as Hamburg Hauptbahnhof and Frankfurt Hauptbahnhof. It and München Ost are two of the 21 stations in Germany classified by Deutsche Bahn as a category 1 station. The mainline station is a terminal station with 32 platforms. The subterranean S-Bahn with 2 platforms and U-Bahn stations with 6 platforms are through stations. Munich is an integral part of the motorway network of southern Germany. Motorways from Stuttgart (W), Nuremberg, Frankfurt and Berlin (N), Deggendorf and Passau (E), Salzburg and Innsbruck (SE), Garmisch Partenkirchen (S) and Lindau (SW) terminate at Munich, allowing direct access to the different parts of Germany, Austria and Italy. Traffic, however, is often very heavy in and around Munich. Traffic jams are commonplace during rush hour as well as at the beginning and end of major holidays in Germany. There are few "green waves" or roundabouts, and the city's prosperity often causes an abundance of obstructive construction sites. Other contributing factors are the extraordinarily high rates of car ownership per capita (multiple times that of Berlin), the city's historically grown and largely preserved centralised urban structure, which leads to a very high concentration of traffic in specific areas, and sometimes poor planning (for example bad traffic light synchronisation and a less than ideal ring road). Franz Josef Strauss International Airport (IATA: MUC, ICAO: EDDM) is the second-largest airport in Germany and seventh-largest in Europe after London Heathrow, Paris Charles de Gaulle, Frankfurt, Amsterdam, Madrid and Istanbul Atatürk. It is used by about 46 million passengers a year, and lies some 30 km (19 mi) north east of the city centre. It replaced the smaller Munich-Riem airport in 1992. The airport can be reached by suburban train lines S8 from the east and S1 from the west of the city. From the main railway station the journey takes 40–45 minutes. An express train will be added that will cut down travel time to 20–25 minutes with limited stops on dedicated tracks. A magnetic levitation train (called Transrapid), which was to have run at speeds of up to 400 km/h (249 mph) from the central station to the airport in a travel time of 10 minutes, had been approved, but was cancelled in March 2008 because of cost escalation and after heavy protests. Lufthansa opened its second hub at the airport when Terminal 2 was opened in 2003. In 2008, the Bavarian state government granted a license to expand Oberpfaffenhofen Air Station located west of Munich, for commercial use. These plans were opposed by many residents in the Oberpfaffenhofen area as well as other branches of local Government, including the city of Munich, which took the case to court. However, in October 2009, the permit allowing up to 9725 business flights per year to depart from or land at Oberpfaffenhofen was confirmed by a regional judge. Despite being 110 km (68 mi) from Munich, Memmingen Airport has been advertised as Airport Munich West. After 2005, passenger traffic of nearby Augsburg Airport was relocated to Munich Airport, leaving the Augsburg region of Bavaria without an air passenger airport within close reach. The Munich agglomeration sprawls across the plain of the Alpine foothills comprising about 2.6 million inhabitants. Several smaller traditional Bavarian towns and cities like Dachau, Freising, Erding, Starnberg, Landshut and Moosburg are today part of the Greater Munich Region, formed by Munich and the surrounding districts, making up the Munich Metropolitan Region, which has a population of about 6 million people. 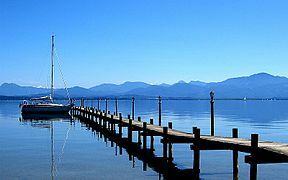 South of Munich, there are numerous nearby freshwater lakes such as Lake Starnberg, Ammersee, Chiemsee, Walchensee, Kochelsee, Tegernsee, Schliersee, Simssee, Staffelsee, Wörthsee, Kirchsee and the Osterseen (Easter Lakes), which are popular among the people of Munich for recreation, swimming and watersports and can be quickly reached by car and a few also by Munich's S-Bahn. Joey Heindle, born in 1993, DSDS participant in season 9. ^ Two meteorological stations are responsible for the climatological data so that they are interpolated. ^ Landeshauptstadt München, Redaktion. "Landeshauptstadt München – Bevölkerung". Landeshauptstadt München. Retrieved 12 February 2016. ^ a b "The Munich Metropolitan Region" (in German). Europäische Metropolregion München e.V. Retrieved 17 April 2017. ^ "Quality of Living City Rankings". Retrieved 28 June 2018. ^ "Munich Named The Most Livable City In The World". Forbes. 25 June 2018. Retrieved 2 July 2018. ^ "Alpha, Beta and Gamma cities (updated 2015)". Spotted by Locals. ^ Englund, Peter (1993). Ofredsår. Stockholm: Atlantis. ^ "Munich Travel Tourism Munich". muenchen.de. Retrieved 12 February 2016. ^ "Ausländeranteil in der Bevölkerung: In München ist die ganze Welt zu Hause – Abendzeitung München". www.abendzeitung-muenchen.de. Retrieved 31 December 2015. ^ "Ausstellung im Foyer". Stmf.bayern.de. Archived from the original on 6 March 2012. Retrieved 25 July 2012. ^ "Gesunde Luft für Gesunde Bürger – Stoppt Dieselruß! – Greenpeace misst Feinstaub und Dieselruß in München". Greenpeace-Munich branch. 28 June 2005. Archived from the original on 24 July 2012. Retrieved 25 July 2012. ^ "Toytown Germany – English language news and chat". toytowngermany.com. ^ "Munich, Germany Köppen Climate Classification (Weatherbase)". Weatherbase. Retrieved 5 February 2019. ^ Jordan-Bychkov, Terry G.; Jordan, Bella Bychkova; Murphy, Alexander B. (28 August 2008). The European Culture Area: A Systematic Geography. Rowman & Littlefield Publishers. ISBN 9780742579064. ^ "Munich — Climate-ADAPT". web.archive.org. 19 March 2018. Retrieved 5 February 2019. ^ "Extremwertetafel (München-Riem)". SKlima.de. Archived from the original on 12 February 2019. Retrieved 12 February 2019. ^ "Extremwertetafel (München-Botanischer Garten)". SKlima.de. Archived from the original on 12 February 2019. Retrieved 12 February 2019. ^ Stationsgeschichte der Messgeräte, DWD. Retrieved 12 February 2019. ^ "CDC (Climate Data Center)". DWD. Retrieved 2 May 2016. ^ "Munich". World Weather Information Service. WMO. June 2011. ^ "Climate Munich – Germany". climatedata.eu. Climate Data. "Muenchen-Flughafen, Germany". Climate-Charts.com. Archived from the original on 15 June 2011. Retrieved 21 April 2011. ^ "Die ausländische Bevölkerung nach der Staatsangehörigkeit 2017" (PDF). Retrieved 19 June 2018. ^ "Landeshauptstadt München: Bevölkerungsbestand - Aktuelle Jahreszahlen: Die Bevölkerung in den Stadtbezirken nach ausgewählten Konfessionen am 31.12.2017" (PDF). muenchen.de. Retrieved 21 March 2018. ^ "Bevölkerung im regionalen Vergleich nach Religion (ausführlich) in %". Statistische Ämter des Bundes und der Länder. 2014. Retrieved 7 May 2018. ^ "Best 110 historic places worldwide". Traveler.nationalgeographic.com. Retrieved 14 April 2010. ^ "Olympia 2018 in Südkorea, München chancenlos". Die Welt (in German). 6 July 2011. Retrieved 6 July 2011. ^ "Munich To Bid Once Again". Games Bids. 27 September 2011. Retrieved 12 April 2016. ^ "Public Indoor Swimming Pools in Munich". muenchen.de – The official city portal. Retrieved 6 September 2016. ^ "Public Outdoor Swimming Pools in Munich". muenchen.de – The official city portal. Retrieved 6 September 2016. ^ "Munich: Swimming pools". Munich City Utilities Company (SWM). Retrieved 5 September 2016. 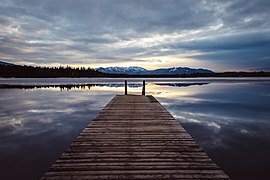 ^ "Lakes in Munich" (in German). muenchen.de – The official city portal. Retrieved 6 September 2016. ^ Riverbreak Editorial Team. "River Surfing Spots: Eisbach". Riverbreak: The International River Surf Magazine. Retrieved 7 August 2016. ^ Toytown Germany. "River surfing in Munich". The Local Europe GmbH. Retrieved 7 August 2016. ^ "Museum Reich der Kristalle München". Lrz-muenchen.de. Archived from the original on 15 April 2009. Retrieved 5 May 2009. ^ a b Hecktor, Mirko; von Uslar, Moritz; Smith, Patti; Neumeister, Andreas (1 November 2008). Mjunik Disco – from 1949 to now (in German). ISBN 978-3936738476. ^ "Giesinger Bräu München". Giesinger Bräu München (in German). Retrieved 25 October 2017. ^ "Circus Krone: Europe's largest traditional circus". Munichfound.com. December 2005. Retrieved 1 May 2013. ^ "Corpus Techno: The music of the future will soon be history". MUNICHfound.com. Retrieved 5 February 2017. ^ "List of bars in Munich" (in German). muenchen.de – The official city portal. Retrieved 6 September 2016. ^ "List of nightclubs in Munich" (in German). muenchen.de – The official city portal. Retrieved 6 September 2016. ^ "Management Studium – Private Hochschule – ISM Intern. School of Mgmt". ism.de. Retrieved 12 February 2016. ^ "Study conducted by INSM (New Social Market Economy Initiative) and WirtschaftsWoche magazine". Icm-muenchen.de. Archived from the original on 19 June 2012. Retrieved 25 July 2012. ^ "Statistik der BA". statistik.arbeitsagentur.de. Retrieved 16 July 2014. ^ Artikel empfehlen: (27 September 2010). "Endlich amtlich: Köln ist Millionenstadt". Koeln.de. Retrieved 15 September 2011. ^ "In Hesse the purchasing power is highest in Germany – CyberPress". Just4business.eu. Retrieved 25 July 2012. ^ "Global 500 2008: Cities". Money.cnn.com. 21 July 2008. Retrieved 25 July 2012. ^ "Insurance - Munich Financial Centre Initiative". www.fpmi.de. Retrieved 27 February 2018. ^ "Munich Literature House: About Us". Archived from the original on 4 April 2003. Retrieved 17 February 2008. ^ "Bavaria Film GmbH: Company Start". Bavaria-film.de. Archived from the original on 29 May 2012. Retrieved 25 July 2012. ^ "Die 10 größten Arbeitgeber in München". Jobs-münchen.com. Retrieved 18 February 2016. ^ a b "Munich Transport Corporation (MVG) Sustainability Report 2014/2015" (PDF). www.mvg.de. Retrieved 10 January 2019. ^ "Munich Public Transportation Statistics". Global Public Transit Index by Moovit. Retrieved 19 June 2017. Material was copied from this source, which is available under a Creative Commons Attribution 4.0 International License. ^ "OpenRailwayMap" (Map). Map of München Hauptbahnhof. Cartography by OpenStreetMap. OpenRailwayMap. 28 September 2014. Retrieved 19 October 2014. ^ "Lageplan Hauptbahnhof München" (PDF) (orientation map) (in German). Deutsche Bahn AG. 2014. Archived from the original (PDF) on 4 February 2015. Retrieved 19 October 2014. ^ "Germany to build maglev railway". BBC News. 25 September 2007. Retrieved 7 April 2008. ^ "Germany Scraps Transrapid Rail Plans". Deutsche Welle. 27 March 2008. Retrieved 27 March 2008. ^ "Flughafen Oberpfaffenhofen: Rolle rückwärts – Bayern – Aktuelles – merkur-online" (in German). Merkur-online.de. Retrieved 25 July 2012. 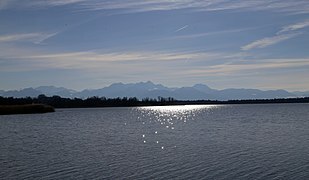 ^ "Lakes in Munich's vicinity" (in German). muenchen.de – The official city portal. Retrieved 6 September 2016. ^ "Partnerstädte". Muenchen.de (official website) (in German). Landeshauptstadt München. Retrieved 17 November 2014. ^ "Verona – Gemellaggi" (in Italian). Council of Verona, Italy. Retrieved 3 April 2013. ^ "Bordeaux-Atlas français de la coopération décentralisée et des autres actions extérieures". Délégation pour l'Action Extérieure des Collectivités Territoriales (Ministère des Affaires étrangères) (in French). Archived from the original on 7 February 2013. Retrieved 29 July 2013. ^ "DSDS 2012: Kandidat Joey Heindle" (in German). RTL. Retrieved 18 April 2012. The sporting nature of the event was largely overshadowed by the Munich massacre in the second week, in which eleven Israeli athletes and coaches and a West German police officer at Olympic village were killed by Black September terrorists. The 1972 Summer Olympics were the second Summer Olympics to be held in Germany, after the 1936 Games in Berlin, which had taken place under the Nazi regime. The West German Government had been eager to have the Munich Olympics present a democratic and optimistic Germany to the world, as shown by the Games' official motto, "Die Heiteren Spiele", or "the cheerful Games". The logo of the Games was a blue solar logo (the "Bright Sun") by Otl Aicher, the designer and director of the visual conception commission. The Olympic mascot, the dachshund "Waldi", was the first officially named Olympic mascot. The Olympic Fanfare was composed by Herbert Rehbein.The Olympic Park (Olympiapark) is based on Frei Otto's plans and after the Games became a Munich landmark. The competition sites, designed by architect Günther Behnisch, included the Olympic swimming hall, the Olympics Hall (Olympiahalle, a multipurpose facility) and the Olympic Stadium (Olympiastadion), and an Olympic village very close to the park. The design of the stadium was considered revolutionary, with sweeping canopies of acrylic glass stabilized by metal ropes, used on such a large scale for the first time. The 2011–12 UEFA Champions League was the 57th season of Europe's premier club football tournament organised by UEFA, and the 20th season in its current Champions League format. As part of a trial that started in the 2009–10 UEFA Europa League, two extra officials – one behind each goal – were used in all matches of the competition from the play-off round.The final was held at the Allianz Arena in Munich, Germany. Chelsea's caretaker manager Roberto Di Matteo led the club to win their first Champions League title after beating Bayern Munich 4–3 on penalties in the final. As tenants of the Allianz Arena (known as Fußball Arena München for the final), this meant that Bayern were the first finalists to have home advantage since 1984. By winning the tournament, Chelsea earned a berth at the 2012 FIFA Club World Cup and 2012 UEFA Super Cup. Barcelona were the defending champions, but were eliminated by the eventual winners Chelsea in the semi-finals. The 2012 UEFA Champions League Final was a football match which took place on Saturday, 19 May 2012 between Bayern Munich of Germany and Chelsea of England at the Allianz Arena in Munich, Germany. The match was to decide the winner of the 2011–12 season of the UEFA Champions League, Europe's premier club football tournament. Bayern were making their ninth appearance in the competition's final, having won four and lost four, most recently losing in 2010. Chelsea were appearing in their second final, having lost their first in 2008. It was the first Champions League final to be held at the Allianz Arena (known as Fußball Arena München for the final). As tenants of the Arena, this meant Bayern were the first finalists to have home advantage since 1984. Both teams progressed to the knockout stages by finishing top of their group. Bayern then beat Basel, Marseille and Real Madrid to reach the final, while Chelsea knocked out Napoli, Benfica and defending champions Barcelona. Bayern took the lead late in the second half through Thomas Müller, but Didier Drogba equalised for Chelsea five minutes later to take the game to extra time, in which Arjen Robben missed an awarded penalty, Petr Čech saving the low drive. The teams stayed level at 1–1 and the match went to a penalty shoot-out, which Chelsea won 4–3 to clinch their first Champions League title. In doing so, they became the first London club to win the tournament, the fifth English club and 22nd overall. As winners, Chelsea took part in the 2012 UEFA Super Cup, losing 4–1 to Atlético Madrid, the winners of the 2011–12 UEFA Europa League. The victory also allowed them to enter the following season's Champions League competition (having failed to qualify for it by their league finishing position) at the expense of London rivals Tottenham Hotspur, who would otherwise have entered the competition having finished fourth in the Premier League. Chelsea also represented UEFA at the 2012 FIFA Club World Cup, entering at the semi-final stage; however, they were beaten 1–0 by Corinthians in the final. Allianz Arena [ʔaˈli̯ants ʔaˌʁeːnaː] is a football stadium in Munich, Bavaria, Germany with a 75,000 seating capacity. Widely known for its exterior of inflated ETFE plastic panels, it is the first stadium in the world with a full colour changing exterior. Located at 25 Werner-Heisenberg-Allee at the northern edge of Munich's Schwabing-Freimann borough on the Fröttmaning Heath, it is the second-largest arena in Germany behind Westfalenstadion in Dortmund. FC Bayern Munich has played its home games at the Allianz Arena since the start of the 2005–06 season. The club had previously played their home games at the Munich Olympic Stadium since 1972. 1860 Munich previously had a 50% share in the stadium, but Bayern Munich purchased their shares for €11 million in April 2006. The arrangement allowed 1860 Munich to play at the stadium while retaining no ownership until 2025. However, in July 2017 the rental contract was terminated, making Bayern Munich the sole tenants of the stadium.The large financial services provider Allianz purchased the naming rights to the stadium for 30 years. However, this name cannot be used when hosting FIFA and UEFA events, since these governing bodies have policies forbidding corporate sponsorship from companies that are not official tournament partners. During the 2006 FIFA World Cup, the stadium was referred to as FIFA WM-Stadion München (FIFA World Cup Stadium, Munich). In UEFA club and Nations League matches, it is known as Fußball Arena München (Football Arena Munich) [ˌfuːsbal ʔaʁeːnaː ˈmʏnçn̩], and it hosted the 2012 UEFA Champions League Final. The stadium has been nicknamed "Schlauchboot" ("dinghy"). Since 2012 the museum of Bayern Munich, FC Bayern Erlebniswelt, has been located inside the Allianz Arena. Arjen Robben (Dutch pronunciation: [ˈɑrjən ˈrɔbə(n)] (listen); born 23 January 1984) is a Dutch professional footballer who plays for German club Bayern Munich. He usually plays as a left or right sided winger, known for his dribbling skills, speed, crossing ability and his accurate left foot long-range shots from the right wing. Robben first came to prominence with Groningen, for whom he was player of the year for the 2000–01 Eredivisie season. Two years later he signed for PSV, where he became the Netherlands' Young Player of the Year and won an Eredivisie title. The following season Robben's signature was pursued by leading English clubs, and after protracted transfer negotiations he joined Chelsea in 2004. Robben's Chelsea debut was delayed through injury, but upon returning to fitness he helped Chelsea bring home two consecutive Premier League titles, and was the Premier League Player of the Month in November 2005. After a third season in England which was punctuated by injury, Robben moved to Spanish club Real Madrid for €35 million. In August 2009, Robben transferred to Bayern Munich for a fee of around €25 million, scoring two goals on his debut. In his first season in Munich, Bayern won the league title, Robben's fifth league title in eight years, and Robben scored the winning goal in the 2013 UEFA Champions League Final, being named to the Squad of the Season. He also appeared in the 2010 FIFA World Cup Final, which the Netherlands lost to Spain. In 2014, he was named to the FIFPro World XI and the UEFA Team of the Year, and fourth place in the Ballon d'Or.Robben has appeared at the 2004, 2008 and 2012 UEFA European Championships, and the 2006, 2010 and 2014 FIFA World Cups, in the latter he was named the Bronze Ball and to the All-Star Team. In 2014, Robben was ranked as the fourth-best footballer in the world by The Guardian. The Beer Hall Putsch, also known as the Munich Putsch, and, in German, as the Hitlerputsch, Hitler-Ludendorff-Putsch, Bürgerbräu-Putsch or Marsch auf die Feldherrnhalle ("March on the general's hall"), was a failed coup d'état by the Nazi Party (NSDAP) leader Adolf Hitler—along with Generalquartiermeister Erich Ludendorff and other Kampfbund leaders—to seize power in Munich, Bavaria, which took place from 8 November to 9 November 1923. Approximately two thousand Nazis were marching to the Feldherrnhalle, in the city center, when they were confronted by a police cordon, which resulted in the death of 16 Nazis and four police officers. Hitler, who was wounded during the clash, escaped immediate arrest and was spirited off to safety in the countryside. After two days, he was arrested and charged with treason.The putsch brought Hitler to the attention of the German nation and generated front-page headlines in newspapers around the world. His arrest was followed by a 24-day trial, which was widely publicised and gave him a platform to publicise his nationalist sentiment to the nation. Hitler was found guilty of treason and sentenced to five years in Landsberg Prison, where he dictated Mein Kampf to his fellow prisoners Emil Maurice and Rudolf Hess. On 20 December 1924, having served only nine months, Hitler was released. Hitler now saw that the path to power was through legal means rather than revolution or force, and accordingly changed his tactics, further developing Nazi propaganda. The Bundesliga (German: [ˈbʊndəsˌliːɡa] (listen); lit. English: "Federal League", sometimes referred to as the Fußball-Bundesliga [ˌfuːsbal-] or 1. Bundesliga [ˌʔeːɐ̯stə-]) is a professional association football league in Germany and the football league with the highest average stadium attendance worldwide. At the top of the German football league system, the Bundesliga is Germany's primary football competition. The Bundesliga comprises 18 teams and operates on a system of promotion and relegation with the 2. Bundesliga. Seasons run from August to May. Most games are played on Saturdays and Sundays, with a few games played on weekdays. All of the Bundesliga clubs qualify for the DFB-Pokal. The winner of the Bundesliga qualifies for the DFL-Supercup. 54 clubs have competed in the Bundesliga since its founding. Bayern Munich has won the Bundesliga the most, winning the title 27 times. However, the Bundesliga has seen other champions with Borussia Dortmund, Hamburger SV, Werder Bremen, Borussia Mönchengladbach and VfB Stuttgart most prominent among them. The Bundesliga is one of the top national leagues, ranked fourth in Europe according to UEFA's league coefficient ranking for the 2017–18 season, based on performances in European competitions over the past five seasons. The Bundesliga is the number-one football league in the world in terms of average attendance; out of all sports, its average of 45,134 fans per game during the 2011–12 season was the second highest of any sports league in the world after the American National Football League. The Bundesliga is broadcast on television in over 200 countries.The Bundesliga was founded in 1962 in Dortmund and the first season started in 1963. The structure and organisation of the Bundesliga along with Germany's other football leagues have undergone frequent changes. The Bundesliga was founded by the Deutscher Fußball-Bund (English: German Football Association), but is now operated by the Deutsche Fußball Liga (English: German Football League). Fußball-Club Bayern München e.V., commonly known as FC Bayern München (German pronunciation: [ʔɛf tseː ˈbaɪɐn ˈmʏnçn̩]), FCB, Bayern Munich, or FC Bayern, is a German sports club based in Munich, Bavaria (Bayern). It is best known for its professional football team, which plays in the Bundesliga, the top tier of the German football league system, and is the most successful club in German football history, having won a record 28 national titles and 18 national cups.FC Bayern was founded in 1900 by 11 football players, led by Franz John. Although Bayern won its first national championship in 1932, the club was not selected for the Bundesliga at its inception in 1963. The club had its period of greatest success in the middle of the 1970s when, under the captaincy of Franz Beckenbauer, it won the European Cup three times in a row (1974–1976). Overall, Bayern has reached ten European Cup/UEFA Champions League finals, most recently winning their fifth title in 2013 as part of a continental treble. Bayern has also won one UEFA Cup, one European Cup Winners' Cup, one UEFA Super Cup, one FIFA Club World Cup and two Intercontinental Cups, making it one of the most successful European clubs internationally and the only German club to have won both international titles. Since the formation of the Bundesliga, Bayern has been the dominant club in German football, winning 27 titles, including six consecutively since 2013. They have traditional local rivalries with 1860 Munich and 1. FC Nürnberg, as well as with Borussia Dortmund since the mid-1990s. Since the beginning of the 2005–06 season, Bayern has played its home games at the Allianz Arena. Previously the team had played at Munich's Olympiastadion for 33 years. The team colours are red and white, and the team crest shows the white and blue flag of Bavaria. In terms of revenue, Bayern Munich is the biggest sports club in Germany and the fourth highest-earning football club in the world, generating €587.8 million in 2017. For the 2017–18 season, Bayern reported a revenue of €657.4 million and an operating profit of €136.5 million. This was Bayern's 26th year in a row with a profit. In November 2018, Bayern had 291,000 official members and there are 4,433 officially registered fan clubs with over 390,000 members. The club has other departments for chess, handball, basketball, gymnastics, bowling, table tennis and senior football with more than 1,100 active members. As of January 2019, FC Bayern is ranked joint second in the current UEFA club coefficient rankings. The UEFA Champions League is a seasonal football competition established in 1955. The UEFA Champions League is open to the league champions of all UEFA (Union of European Football Associations) member associations (except Liechtenstein, which has no league competition), as well as to the clubs finishing from second to fourth position in the strongest leagues. Prior to the 1992–93 season, the tournament was named the European Cup. Originally, only the champions of their respective national league and the defending champion of the competition were allowed to participate. However, this was changed in 1997 to allow the runners-up of the stronger leagues to compete as well. In the Champions League era, the defending champion of the competition did not automatically qualify until the rules were changed in 2005 to allow title holders Liverpool to enter the competition.Teams that have won the UEFA Champions League three times in a row, or five times overall, receive a multiple-winner badge. Six teams have earned this privilege: Real Madrid, Ajax, Bayern Munich, Milan, Liverpool and Barcelona. Until 2009, clubs that had earned that badge were allowed to keep the European Champion Clubs' Cup and a new one was commissioned; since 2009, the winning team each year has received a full-size replica of the trophy, while the original is retained by UEFA.A total of 22 clubs have won the Champions League/European Cup. Real Madrid hold the record for the most victories, having won the competition 13 times, including the inaugural competition. They have also won the competition the most times in a row, winning it five times from 1956 to 1960. Juventus have been runners-up the most times, losing seven finals. Atlético Madrid is the only team to reach three finals without having won the trophy while Reims and Valencia have finished as runners-up twice without winning. Spain has provided the most champions, with 18 wins from two clubs. Italy have produced 12 winners from three clubs and England have produced 12 winners from five clubs. English teams were banned from the competition for five years following the Heysel disaster in 1985. The current champions are Real Madrid, who beat Liverpool in the 2018 final. Munich is a 2005 historical drama film produced and directed by Steven Spielberg and written by Tony Kushner and Eric Roth. It is based on the book Vengeance, an account of Operation Wrath of God, the Israeli government's secret retaliation against the Palestine Liberation Organization after the Munich massacre at the 1972 Summer Olympics. Munich received five Academy Awards nominations: Best Picture, Best Director, Best Adapted Screenplay, Best Editing and Best Score. The film made $130 million worldwide but just $47 million in the United States, making it one of Spielberg's lowest-grossing films domestically. In 2017, the film was named the sixteenth "Best Film of the 21st Century So Far" by The New York Times. The Munich Agreement (Czech: Mnichovská dohoda; Slovak: Mníchovská dohoda; German: Münchner Abkommen) or Munich Betrayal (Czech: Mnichovská zrada; Slovak: Mníchovská zrada) was an agreement concluded at Munich, September 29, 1938, by Germany, Great Britain, France and Italy. It provided "cession to Germany of the Sudeten German territory" of Czechoslovakia. Most of Europe celebrated because it prevented the war threatened by Adolf Hitler by allowing Nazi Germany's annexation of the Sudetenland, a region of western Czechoslovakia inhabited by 800,000 people, mainly German speakers. Hitler announced it was his last territorial claim in Europe, and the choice seemed to be between war and appeasement. An emergency meeting of the main European powers – not including Czechoslovakia or the Soviet Union, an ally to both France and Czechoslovakia – took place in Munich, Germany, on 29–30 September 1938. An agreement was quickly reached on Hitler's terms. It was signed by the top leaders of Germany, France, Britain, and Italy. Militarily, the Sudetenland was of strategic importance to Czechoslovakia as most of its border defenses were situated there to protect against a German attack. The agreement between the four powers was signed on the backdrop of a low-intensity undeclared German-Czechoslovak war that had started on 17 September 1938. Meanwhile Poland, which was relying on German–Polish Non-Aggression Pact, also moved its army units towards its common border with Czechoslovakia after 23 September 1938. Facing the combined force of Germany and Poland alongside most of its border (with the major part of the remaining border being with Hungary), Czechoslovakia yielded to French and British diplomatic pressure and ceded the Sudetenland to Germany in line with the terms of the agreement. The Munich Agreement was soon followed by the First Vienna Award on 2 November 1938, separating largely Hungarian inhabited territories in southern Slovakia and southern Subcarpathian Rus' from Czechoslovakia, while Poland also annexed territories from Czechoslovakia in the North. In March 1939, the First Slovak Republic was proclaimed, and shortly by the creation of the Protectorate of Bohemia and Moravia Germany took full control of the remaining Czech parts. As a result, Czechoslovakia had disappeared. Today, the Munich Agreement is widely regarded as a failed act of appeasement, and the term has become "a byword for the futility of appeasing expansionist totalitarian states". Munich Airport (German: Flughafen München) (IATA: MUC, ICAO: EDDM) is the international airport of Munich, the capital of Bavaria, Germany. It is the second-busiest airport in Germany in terms of passenger traffic after Frankfurt Airport, and the seventh-busiest airport in Europe, handling 46.3 million passengers in 2018. It is the world's 15th-busiest airport in terms of international passenger traffic, and was the 38th-busiest airport worldwide in 2018. As of March 2018, the airport features flights to 266 destinations, making it the airport with the fifth-most destinations worldwide. Munich Airport serves as a hub for Lufthansa including Lufthansa Regional and its Star Alliance partners. The airport is located 28.5 km (17.7 mi) northeast of Munich near the city of Freising and is named after former Bavarian minister-president Franz Josef Strauss who was born in Munich. It features two passenger terminals with an additional midfield terminal, two runways as well as extensive cargo and maintenance facilities and is fully equipped to handle wide-body aircraft including the Airbus A380. The Munich massacre was an attack during the 1972 Summer Olympics in Munich, West Germany, in which the Palestinian terrorist group Black September took eleven Israeli Olympic team members hostage and killed them along with a West German police officer.Shortly after the crisis began, a Black September spokesman demanded that 234 Palestinian prisoners jailed in Israel and the West German–held founders of the Red Army Faction, Andreas Baader and Ulrike Meinhof, be released. Black September called the operation "Iqrit and Biram", after two Palestinian Christian villages whose inhabitants were expelled by the Israel Defense Forces (IDF) during the 1948 Arab–Israeli War. The Black September commander, Luttif Afif, was born to Jewish and Christian parents. His group was associated with secular nationalism, working for the rights of Palestinians in Israel. West German neo-Nazis gave the group logistical assistance.Police officers killed five of the eight Black September members during a failed attempt to rescue the hostages. A West German policeman was also killed in the crossfire. The other three Palestinian hijackers were captured. The next month, however, following the hijacking of Lufthansa Flight 615, the West German government released them in a hostage exchange. Mossad responded with the 1973 Israeli raid on Lebanon and Operation Wrath of God, tracking down and killing Palestinians suspected of involvement in the Munich massacre.Two days prior to the start of the 2016 Summer Olympics, in a ceremony led by Brazilian and Israeli officials, the International Olympic Committee honored the eleven Israelis that were killed at Munich. Robert Lewandowski (Polish pronunciation: [ˈrɔbɛrt lɛvanˈdɔfskʲi] (listen); born 21 August 1988) is a Polish professional footballer who plays as a striker for Bayern Munich and is the captain of the Poland national team. After being the top scorer in the third and second tiers of Polish football with Znicz Pruszków, he moved to top-flight Lech Poznań, and was the top scorer in the league as they won the 2009–10 Ekstraklasa. In 2010, he transferred to Borussia Dortmund for a reported €4.5 million, where he won honours including two consecutive Bundesliga titles and a season as the league's top goalscorer. In 2013, he earned with Borussia a spot in the 2013 UEFA Champions League Final, a tournament in which he was the second top goalscorer, behind only Cristiano Ronaldo.Prior to the start of the 2014–15 season, Lewandowski agreed to join Dortmund's domestic rivals, Bayern Munich, on a free transfer. In Munich, he won the Bundesliga title in each of his first four campaigns, earning a spot in the Bundesliga Team of the Year in every season. In 2015–16 and 2017–18, he led the league in goalscoring, and in 2016–17 he was named the Bundesliga Player of The Year. He was named to the UEFA Champions League Squad of the Season two times. He has scored over 200 goals in the Bundesliga, having reached the century mark quicker than any other foreign player, and is the league's all-time leading foreign goalscorer. He also holds the record for the fastest five goal haul in any major European football league since records have been kept after scoring five times in nine minutes against Wolfsburg in 2015.A full international for Poland since 2008, Lewandowski has earned over 100 caps and was a member of their team at Euro 2012, Euro 2016 and 2018 FIFA World Cup. With 56 international goals, Lewandowski is the all-time top scorer for Poland. In 2015, he was voted Polish Sportspersonality of the Year and in 2016 he claimed fourth place at the 2015 FIFA Ballon d'Or Awards. He has been named the Polish Player of the Year a record seven times. The Guardian has ranked him as the fifth-best footballer on the planet in 2015. Turn- und Sportverein München von 1860, commonly known as TSV 1860 München (German pronunciation: [teː ʔɛs faʊ ˈʔaxtseːnˈhʊndɐt ˈzɛçtsɪç ˈmʏnçn̩]) or 1860 Munich, is a Turnverein based in Munich. After the 2016–17 season the club's football team was relegated from the 2. Bundesliga. 1860 Munich was one of the founding members of the Bundesliga in 1963, becoming West German champions in 1966, and has played a total of 20 seasons in the top flight. From 2005 to 2017, 1860 Munich's stadium had been the Allianz Arena. Since their relegation from 2. Bundesliga, the Stadion an der Grünwalder Straße is once again home to 1860 Munich. The Technical University of Munich (TUM) (German: Technische Universität München) is a research university with campuses in Munich, Garching and Freising-Weihenstephan. It is a member of TU9, an incorporated society of the largest and most notable German institutes of technology. TUM is ranked 4th overall in Reuters 2017 European Most Innovative University ranking. TUM's alumni include 17 Nobel laureates, 18 Leibniz Prize winners and 22 IEEE Fellow Members.